Things have been really hectic at work this week so I haven't been able to focus on my blogging duties (don't you hate it when life gets in the way?). Nonetheless I have finally drawn a winner! Which is why for I strongly suggest that for Baby Rain's Birthday Giveaway, please make use of the numerous extra options, in order to increase your chances of winning! 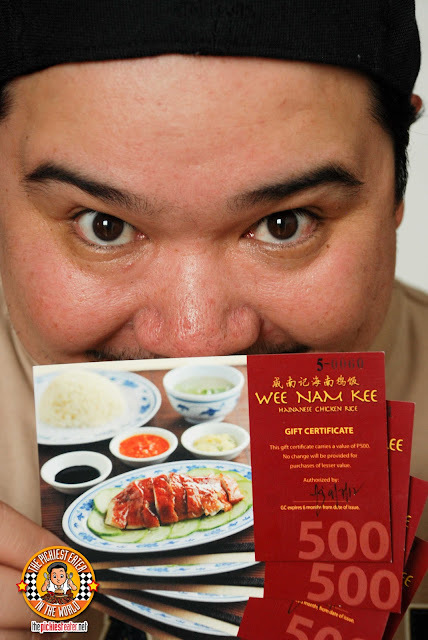 You just won yourself P2,000 worth of GC's From Wee Nam Kee!! I recognized Alleyson from her twitter account, because she was one of those contestants that was relentless in tweeting everyday.. So this is a much deserved win for her. Congratulations again! Alleyson, I will be emailing you within the next few days regarding details on how I'll be sending you your prize. This was the final giveaway from my anniversary series, as I've moved on to Baby Rain's Birthday Giveaway. Since my Blog's anniversary was actually in June, still calling it an "Anniversary Giveaway" is kind ridiculous, don't ya think? i know you'll be feeling like you're on cloud nine right now..